Join the best of the Marvel Universe for the first seven episodes from Season One of the electrifying new animated series, The Avengers: Earth’s Mightiest Heroes! Get ready for nonstop action as Iron Man, Thor, Captain America, the Hulk, Ant-Man, the Wasp, Hawkeye and the Black Panther join forces to battle a legion of villains bent on the total destruction of humanity. Experience The Avengers at their very best in this spectacular coll..
Get ready for more action-packed adventure with The Avengers: Earth’s MightiestHeroes!, Volume 2. The excitement reaches new heights as the best of the Marvel Universe stand together to battle Klaw, Baron, Zemo, The Enchantress, and a horde of the Leader’s Gamma- Mutated Monsters. Bring home six sensational episodes from Season One of Marvel’s newest animated series. Episodes: 8. Some Assembly Required 9. Living Legend 10. Everything i..
Get ready for the ultimate adrenaline rush with Volume 4 of The Avengers: Earth's Mightiest Heroes! 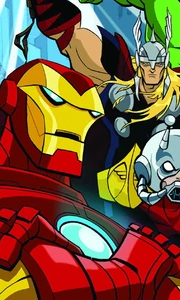 In these final seven episodes of Season One, Iron Man, Thor, Captain America, Hulk and the rest of the Avengers attempt to stop Ultron and his army of robots from ending all of humanity and prevent Loki from unleashing armies from Asgard on Earth! Episodes: 20. The Casket Of Ancient Winters 21. Hail, Hydra! 22. Ultron-5 23. The Ultron Im..
Own Avengers - Earths Mightiest Heroes - Volumes 1 to 8 DVD from Deff, DVD, Blu-Ray & 4K Video Specialists - Free UK Delivery..
After interfering with a top secret mission, The Punisher is taken into custody by S.H.I.E.L.D. Agent and Avenger, Black Widow. At the orders of Director Nick Fury, Punisher and Black Widow are sent on a mission to stop Leviathan, a global terrorist organization, that plans to sell stolen S.H.I.E.L.D. technology to the highest bidder. Now, the vigilante and spy must work together to prevent this technology from falling into the wrong ha..